You can add hyperlinks to your document that give your readers instant access to information in another part of the same document. The hyperlink can be text or graphics. By using hyperlinks, you can provide information to your readers without repeating the same information on different pages. To add links that jump from one part of a document to another part of the same document, mark the destination and then add a link to it. Mark the hyperlink destination with a bookmark or a heading style. 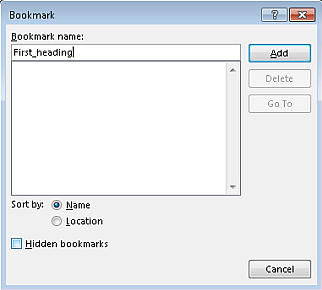 Select text or an item, or click where you want to insert a bookmark. Headings are automatically marked as a destination. All you need to do is apply one of the built-in heading styles. On the Home tab, click the style you want. After you’ve marked the destination, you’re ready to add the link.